Whether you are collecting silver coins as a long-term investment, or for the joy of collecting interesting objects, there are some exquisite pieces in existence. Generally, the value in silver coins is limited to the spot price of the metal (the ‘melt price’), but there are some truly valuable coins, made so because of their uniqueness and desirability by collectors. However, it is the very nature of coin collectors that can make this a fickle investment if you are looking beyond the value in weight of the metal. Although their value fluctuates quite significantly, it can take decades between rise and falling prices. One of the most valuable coins is an 1870 seated liberty silver dollar. With only 15 of them ever made, if you find one you could be looking at a windfall of over USD$ 2,000,000. While the more common American Eagle silver dollar has been in production since 1989 and generally is only worth the price of the silver. However, it does contain quite a bit of silver, so you should be looking at around UDS$20. Although you do obviously get the exceptions, the majority of collectable silver coins have a collector’s value in the hundreds rather than the thousands you might see in gold collectors’ coins. However, this makes building a beautiful coin collection more accessible – and still a valuable thing. One of the most collectable American coins are the Morgan silver dollars, although you will find examples worth around $30,000 generally most are worth around $300-500. However, although it is 90%, weighing just over 26 grams the melt value is only around $15 in silver. Named after it’s designer, George T. Morgan, the American dollar coin was first minted in 1878, and continued to be produced until 1904. It was then minted again in 1921. However, during this time less than 750,000 of the coins were ever produced. It is this relative rarity that makes it a highly collectable coin. 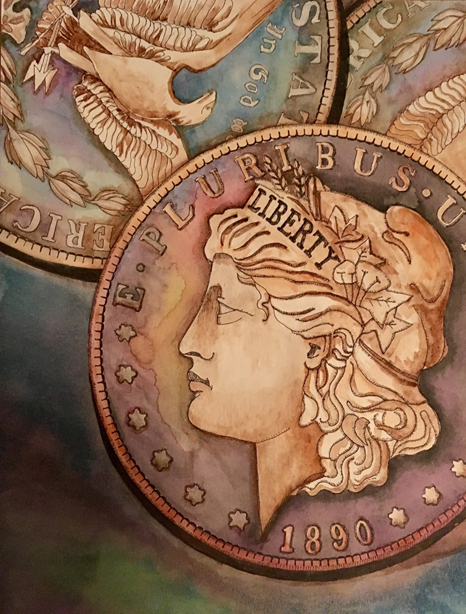 On one side of the coin is a profile portrait of lady liberty, on the other side is an eagle with wings outstretched clasping arrows and olive branch. The Morgan dollars were minted in Philadelphia, New Orleans, San Francisco and Carson City. Each mint usually having its own mint mark. The single 1921 year of production also included production at the Denver mint. As mentioned, the 1895 minting is the most valuable of the Morgan Silver Dollars, fetching around $30,000. Generally, you will only find it as it comes up in the larger auction houses, but that doesn’t stop every collector from hoping that it will appear in a hidden box of treasure. Unfortunately, this coin is also made rarer by its age, as few coins from this period survive, even if they started out in abundance. The next coin to look out for is the 1893 Morgan dollar. Again, because of its limited production run this coin is rare, so therefore valuable. You should be able to get one, if you can find it, for between $5,000 and $10,000. When you start to get into collecting these coins you will discover that they are named along the lines of CC-Morgan or S-Morgan. This refers to the mint marks, the location where the coin was minted. Philadelphia has no mark, Carson City is CC, San Francisco is S, New Orleans is O and Denver is D. Where they have a mint mark you can find this under the “O” of the word ‘dollar’. As different mints produced a different amount of coins, you will generally find the rarer mint to have more valuable coin. How Exactly To Clean Business Goals.